Of course, it is unofficial merchandise, but it’s thoughtfully done! I can’t find a contact form on that site so I have no idea how to reach someone to ask a few questions. It’s not my site and it’s just something I stumbled upon via Instagram (please follow me on Instagram). 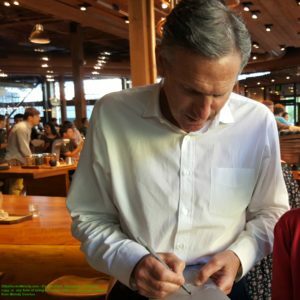 As far as I know, Howard Schultz hasn’t yet announced his candidacy for president! CNBC covered how he might stack up against other candidates here. If this were a Facebook post, I would expect mostly laughing smiley reactions! Your guess is as good as mine on whether Howard will really run for president. 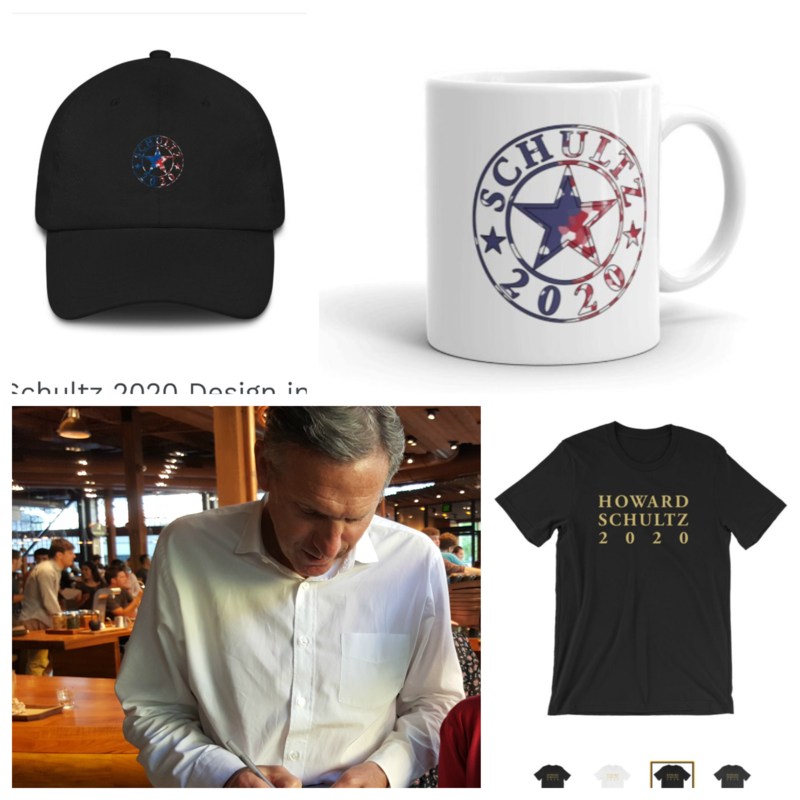 And if you are the owner of the above-mentioned Schultz 2020 memorabilia website, if you could just go ahead and drop a few things in the mail to me, that would be great! I’m a size small or medium in t-shirts, but definitely not a large. Actually probably a small. Just send a little gift box to StarbucksMelody.com 4616 -25th Avenue NE #202, Seattle, Washington 98105. Thank you in advance for the thoughtful gift. Starbucks opens Princi bakery in Seattle: And Starbucks card lovers, there's a Princi card! The treat receipt has returned to Starbucks. Are you taking advantage of it? 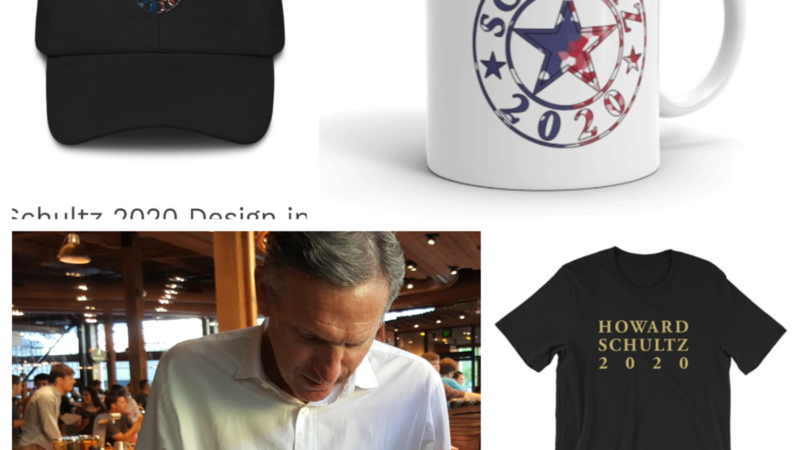 Your 2020 merchandise is way too expensive. Sell the hats for $6.00 instead of $23.00 and you will see alot more people supporting you. It will leave a message that the rich do not necessarily get richer, seeing as you should be appealing to the more financially struggling people. And also lower the price of coffee at Starbucks during the duration of your presidential run that shows you can relate to the common man, which you can, but you gotta prove it. Congratulations on your success, and thank you for your support of progressive issues; but we don’t need yet another rich man with no political experience to run for president. This will divide the Democrats, and ensure that Putin, once again, gets to choose our next president. If you want to run for president, do it the “Old Fashioned Way”, and fight your way up the ranks of candidates like everyone else. Thank you. Howard – Please run, we need you! David Congour – this country needs a centrist party for the masses that stops the never ending cycle of two terrible options at president. Both parties have gone to the extremes and many normal, tax paying citizens want a solid choice that isn’t hard right wing or left. I can already see the choice of the 2020 race – either a leftist socialist or a right wing nut job. Sadly, it’s a coin flip which one is worse for this country long term. I like Howard’s ideas and I think he can connect with the silent majority and those that want a better life for their children. I would vote for him over Trump or any progressive socialist. I work for an amazing company, started by an amazing individual! Our company’s mission is to “inspire and nurture the human spirit, one person, one cup, and one neighborhood at a time.” I have worked for over 40 years, as a broker, an attorney, a banker, and much more and I have never worked for a company that shows so much compassion and concern for its employees. How many places can you work and receive health care coverage while working only 20 hours, 401K match, stock bean awards each year, and more? I volunteer at several places and Starbucks supports my committment by matching my time with $$. All of this started with a person who made his own wealth and recognized the need to help others. Get to know him, maybe read Onward.